Some people prefer working the crossover network as a whole within a single development file opened in the simulation program. Both drivers' measurement data files (SPL and impedance) are described in this file along with all filters' topologies. In the case of old CALSOD, the latter are specified by RES (resistor), CAP (capacitor) and IND (inductor) 'commands' followed by their circuit nodes and value specifications. Node 0 is ground and node 1 usually stands for the crossover master input. When adding new components attention must be paid to node re-numbering. We can proceed to the LF acoustic branch design at first. Surely we do not expect its component results to be final. Yet it helps inexperienced people to concentrate on a small component set before dealing with the network as a whole. We preserve our impedance correction subcircuit (decided in the previous section) and add a second order lowpass filter circuit (one inductor-one capacitor) with startup values of 1mH and 10uF. These values provide an acceptable point to start from since final values for a two way speaker with 8 ohm drivers will be quite close. 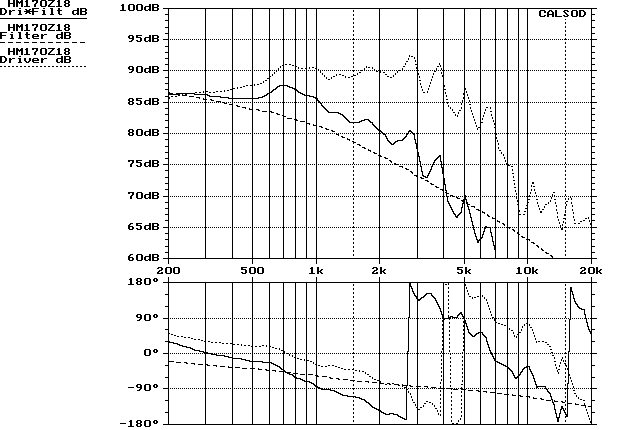 The solid line is the overall SPL response of the LF acoustic branch of our speaker, the dotted one is the woofer alone and the dashed one stands for the LP filter's gain referenced at 86dB in this plot. 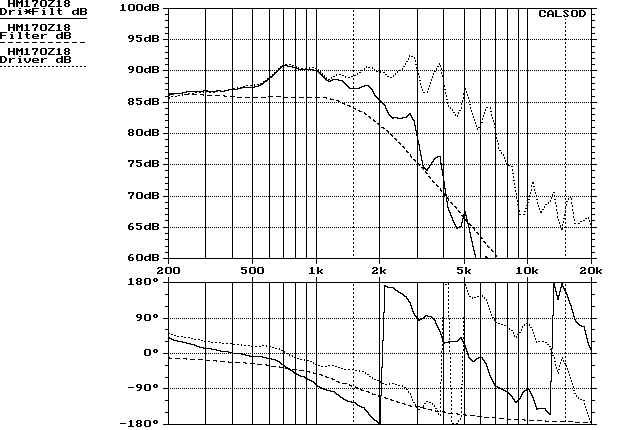 Filters' gain takes values around 0dB. Since this dB value is well out of the range of any SPL curve, we displace gain curves upwards around an arbitrary reference. In this case we chose the 86 dB value. We choose to trim the diffraction step above 400-500Hz by only 2-3dB just to give our project the 'touch' of a large speaker. Our LPF must be changed to introduce a roll-off above 400Hz to compensate the woofer SPL rise. We must keep in our minds the golden rule: filters' roll-off shifts to lower frequencies every time we increase inductance and/or capacitance values. This also works the other way: roll-off shifts to higher frequencies every time we decrease inductance and/or capacitance values. In this case we kept decreasing the capacitor value only to find out that it has little effect. Instead of removing it we stopped at 1uF. Our LF acoustic branch is ready to be matched with the HF one and fill the gap above 1kHz. Intensive experimentation is the key for a successful crossover design. If we get tired after a few hours of changing component values it is a good idea to switch it off and try the next day all over again. It always gets results.